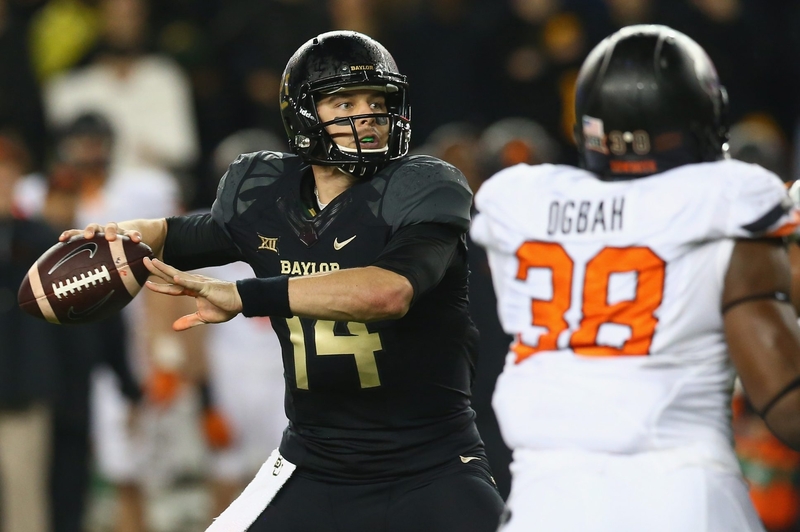 Bryce Petty led a high-powered Baylor offense to the top 10 of the polls last season. How would he look in a Bills’ uniform in the 2015 season? We’ve reached the silly season when it comes to the NFL Draft. Meaningful games haven’t been played for months. The NFL Scouting Combine is history. Pro days have wrapped up. So it’s hard to imagine how any player’s stock can really be “on the rise” at this point. More likely, it’s agents pumping up their clients, or teams trying to push whatever agenda they may have. The Buffalo Bills have largely escaped most of that speculation. Without a first-round pick, and just six selections overall, the team is a mere afterthought when it comes to the pre-draft hype. But that doesn’t mean the Bills’ turn won’t be fascinating. That’s because the roster GM Doug Whaley has put together is short on obvious holes. That means the team truly can draft the “best player available,” regardless of position. Whaley and Co. will meet the Western New York media on Monday for the team’s annual pre-draft luncheon. Don’t expect him to reveal much about the Bills’ draft plan. By now, that should be just about finalized. All that’s left is for NFL Commissioner Roger Goodell to walk to the podium in Chicago’s Auditorium Theatre on April 30 to officially begin the selection process. 1. Tampa Bay Buccaneers. Jameis Winston, QB, Florida State. Not buying for a second that Winston might fall from the top spot. If there is a potential franchise quarterback like Winston available, it’s just too tempting to pass up. 2. San Diego Chargers (projected trade with Tennessee). Marcus Mariota, QB, Oregon. The Bolts make a bold move, trading quarterback Philip Rivers to the Titans for a package that includes the No. 2 overall pick along with the No. 33 pick and a 2016 second-round pick. The Chargers get their potential next franchise quarterback, while the Titans can rebuild around one of the best players in the league at the toughest position to find. 3. Chicago Bears (projected trade with Jacksonville). Leonard Williams, DT, Southern California. It’s easy to give the Bears a wide receiver after trading Brandon Marshall, but they need help across the board on defense and moving up to get perhaps the best player in the 2015 class is a great place to start. 4. Oakland Raiders. Kevin White, WR, West Virginia. The Raiders finished 28th as a team in receiving yardage in 2014. Adding a player like White gives quarterback Derek Carr a No. 1 target. 5. Washington Redskins. Dante Fowler Jr., DE, Florida. Brian Orakpo left in free agency, so Washington needs a replacement. Fowler is just scratching the surface of his potential as a pass rusher. 6. New York Jets. Vic Beasley, OLB, Clemson. I’d expect the Jets to make a hard run at moving up to take Mariota, but if they fail, Beasley is a nice consolation prize. He had 33 sacks and 52.5 tackles for loss in four seasons at Clemson. 7. Jacksonville Jaguars. Shane Ray, DE, Missouri. A dynamic athlete, Ray can play in just about any defensive scheme. He’ll add serious punch to the Jaguars’ pass rush. 8. Atlanta Falcons. Bud Dupree, OLB, Kentucky. The premium on pass rushers continues. Another ridiculous athlete, Dupree posted a 42-inch vertical jump and ran the 40 in 4.56 seconds at the NFL Scouting Combine. The Falcons had just 22 sacks last season, so this is a nice match of need and available talent. 9. New York Giants. Brandon Scherff, OT, Iowa. He might move inside to guard, but no matter where he ends up, Scherff should provide Day One help. 10. St. Louis Rams. Amari Cooper, WR, Alabama. The Rams have struggled to find a No. 1 receiver for a while. Cooper should end that streak. He’s not quite the athlete that White is, but might be more polished. 11. Minnesota Vikings. DeVante Parker, WR, Louisville. A broken foot forced Parker to miss the first half of the 2014 season. Had he been healthy, he might have given White and Cooper a run for being the first receiver off the board. 12. Cleveland Browns. Danny Shelton, DT, Washington. The Browns finished dead last in the NFL in rushing yards allowed last season. Shelton, a 340-pounder, will plug some of those rushing lanes. 13. New Orleans Saints. Randy Gregory, OLB, Nebraska. A positive drug test at the combine will scare away some teams, but Gregory might have the most natural pass-rush talent in the draft. The Saints roll the dice that they can help keep him out of trouble. 14. Miami Dolphins. Trae Waynes, CB, Michigan State. The AFC East is deep with quality receivers and Waynes had an excellent combine, solidifying himself as the top cornerback available. He needs to cut down on the penalties, though, having taken nine over the last two seasons. 15. San Francisco 49ers. Arik Armstead, DT, San Francisco. The 49ers have needs all over the defense, and that’s before Justin Smith makes a decision on retirement. New coach Jim Tomsula is the team’s former defensive line coach, so he might have some sway here. 16. Houston Texans. Breshad Perriman, WR, Central Florida. Perriman ran an amazingly fast 40 time at UCF’s pro day – clocked between 4.19 and 4.27 seconds depending on which scout’s watch you looked at. That speed to go along with his size (6-foot-2, 219 pounds) should easily land him in the first round. 17. San Diego Chargers. Todd Gurley, RB, Georgia. University at Buffalo product Branden Oliver was a nice story as a rookie undrafted free agent last season, but the Bolts would likely rather use him as a third-down back. Gurley has been called the best running back to enter the draft since Adrian Peterson in 2007. 18. Kansas City Chiefs. Jaelen Strong, WR, Arizona State Strong’s NFL comparison is Dwayne Bowe, the player he’d be replacing with the Chiefs. 19. Cleveland Browns (from Buffalo). La’el Collins, OT, LSU. Collins, whose toughness should appeal to coach Mike Pettine, slots in nicely at right tackle. 20. Philadelphia Eagles. Landon Collins, S, Alabama. The trade for Sam Bradford should take quarterback out of the equation for the Eagles, but who knows what Chip Kelly is thinking. 21. Cincinnati Bengals. Kevin Johnson, CB, Wake Forest. The old adage is a team can never have enough cornerbacks, and for the Bengals that’s true. Most of Cincinnati’s depth at the position is under contract for only one more season. 22. Pittsburgh Steelers. Byron Jones, CB, Connecticut. Jones set a world record with a broad jump of 12 feet, 3 inches at the combine. He’s been one of the fastest-rising prospects in the pre-draft process. 23. Detroit Lions. Malcom Brown, DT, Texas. The first-team All-American is another prospect whose stock has risen. After losing Ndamukong Suh and Nick Fairley, the Lions could definitely use Brown. 24. Arizona Cardinals. Melvin Gordon, RB, Wisconsin. After two straight years of a running back failing to be drafted in the first round, two go in 2015. 25. Carolina Panthers. D.J. Humphries, OT, Florida. Quarterback Cam Newton has taken a lot of hits, so to get him some protection the Panthers turn to the hometown product in Humphries. 26. Baltimore Ravens. Jalen Collins, CB, LSU. Made only 10 college starts, but Collins has the height/weight/speed combination teams look for at cornerback (6-1/203/4.48 40). 27. Dallas Cowboys. Marcus Peters, CB, Washington. The Cowboys showed a willingness to take on players with character concerns when they signed Greg Hardy. They’d be doing it again here, as Peters was dismissed from the Huskies in 2014 – and allegedly choked an assistant coach while with the team. 28. Denver Broncos. Cameron Erving, C, Florida State. It’s never a bad idea to get more protection for Peyton Manning. 29. Indianapolis Colts. Andrus Peat, OT, Stanford. Colts bring in Stanford product to protect a Stanford product. 30. New York Jets (projected trade with Green Bay). Brett Hundley, QB, UCLA. The Jets move into the bottom of the first round to secure the possibility of a fifth year on Hundley’s contract. His ability to make plays with his legs should intrigue offensive coordinator Chan Gailey. 31. New Orleans Saints (from Seattle). Phillip Dorsett, WR, Miami (Fla.). This pick came to New Orleans as part of their trade of tight end Jimmy Graham to the Seahawks. The Saints need to replenish their offensive weapons, and Dorsett has game-changing speed. 32. New England Patriots. Eddie Goldman, DT, Florida State. The Super Bowl champions have a hole in their defense where Vince Wilfork once patrolled. 50. Buffalo Bills, second round. Bryce Petty, QB, Baylor. The Bills have done a solid job of filling holes on their roster through trades and free agency. The franchise’s biggest remaining need – and it’s a whopper – is finding the quarterback of the future. Maybe it still can be EJ Manuel, but there’s nothing wrong with doubling down at the game’s most important position. The best-case scenario is both Manuel and Petty show they’re starting material. Then the Bills have significant trade leverage. Petty isn’t ready to start right now, but that’s OK. He can learn from the bench this year, and then compete for the job in 2016. 81. Buffalo Bills, third round. John Miller, G, Louisville. An experienced (47 career starts) player who could compete to be a Day One starter at left guard.